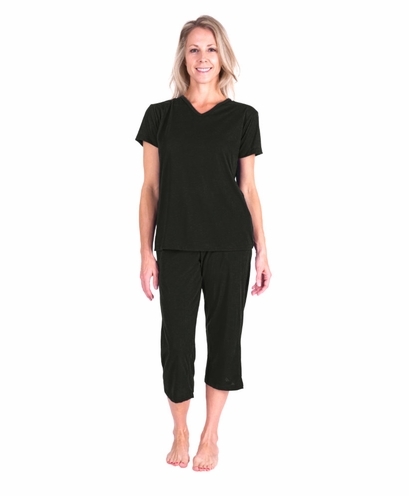 Style #T3418 The new Cool-jams 2 Piece Women's Capri Pajama Set pairs a cool and comfy v-neck t-shirt with matching drawstring capri length bottoms. 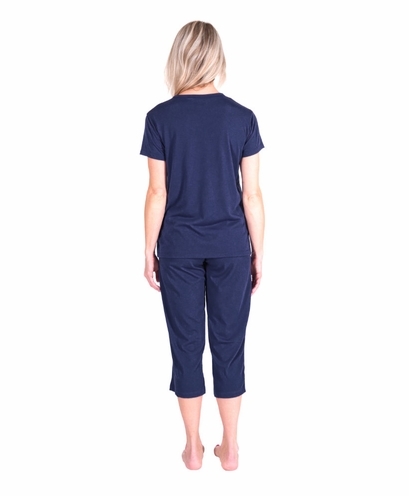 The capri bottoms have an elastic waist, side seam pockets and added drawstring for comfort. 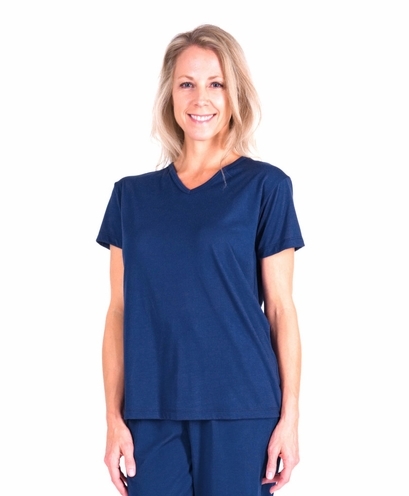 This super quick drying, silky soft, moisture wicking smart fabric is perfect for travel or for combating night sweats. 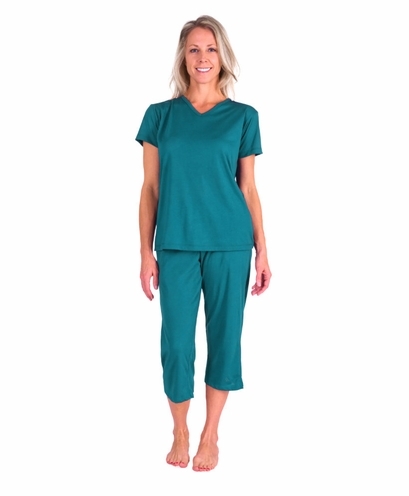 Wear versatile Cool-jams moisture wicking women's pajamas during the day or while sleeping. Every Cool-jams garment uses our smart fabric technology for a super soft, cotton-like feel with wicking ability that never washes out. In fact, the wicking action is scientifically woven into the fabric itself along with technology that inhibits the growth of odor causing bacteria keeping Cool-jams fresh and odor free. Capri inseam length 21". Note: The colors Violet and Turq-Sea are being closed out, so stock is limited in these colors. Wash in cool or warm water on gentle cycle. Never use fabric softener or fabric softener sheets because it will minimize the wicking properties of the fabric. If you accidentally use fabric softeners, re-wash the garment in clear water to remove softener residue, so the wicking properties will return to maximum effectiveness. Lay your garment flat or hang to dry. Tumble drying won't damage the moisture wicking women's pajamas, but can sometimes create static. These PJs are lightweight and very comfortable. Plus, they are well made and attractive. I�ll be ordering more. This is my second set of Cool-jams pajamas. I am going through menopause and the hot flashes at night are awful. These are comfortable to wear and so soft. Definitely helps when my temperature soars! Just make sure not to use softener on them. I absolutely love my Cool-jams. I received my order within 3 days of placing my order so that was great. These are the most comfortable pajamas I have ever worn and they work just like advertised. They wash beautifully. I just cannot praise them enough. Thank you for such a great product. I am post-menopausal, travel often to West Africa, and tend to sleep hot. I wanted long legs and short sleeves to protect me from mosquitoes, yet needed something that breathed and didn't get soggy. These PJs meet all my requirements. Comfy, easy to hand wash (no machine in West Africa) and lthey line-dry quickly. I'll buy more next month. They are better than any other PJs I have, but the rise is a little short. Merchant's comment: We will be creating a longer rise on future styles. Stay tuned. My wife really likes your products and asked me to order three capri sets like the ones I purchased a few years ago. The original ones had elastic waist bands and the new ones have draw strings. I guess I didn't check closely enough. She has decided to keep them anyway but would have preferred elastic waist bands. Still a great product.. Merchant's comment: If you want pjs without drawstring, check out Kristi capri set, Sophia PJ set and our Snap front pj set. all the pants in those sets only have elastic. The pants in other sets include elastic with added drawstring.